Where else but at Cal Day can you watch robots folding laundry, take a mini lesson in Swahili, Zulu or Wolof, and learn how to grow a cranial appendage? Smartphone users: For help navigating the Cal Day experience, follow @UCBerkeleyEvent or #CalDay on Twitter for hour-by-hour recommendations. Follow Cal on Foursquare for event tips at places across UC Berkeley. Check In where you are on campus, find out what’s going on for Cal Day and see who else is there! Rain or shine, the University of California, Berkeley, will open its classrooms, labs, museums, libraries and performance spaces to the public this Saturday, April 16. Cal Day typically draws 40,000 visitors to the world-renowned campus, including prospective students and their families. 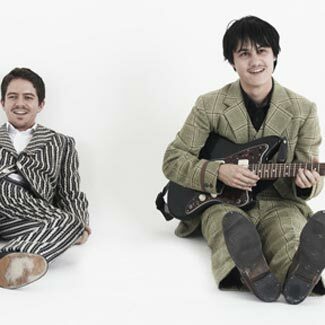 The program, with more than 300 events, runs from 9 a.m. to 4 p.m. and will be followed by a free concert in Memorial Glade featuring The Dodos, a San Francisco-based indie folk group. Cal Day this year highlights public service in light of the 50th anniversary of the Peace Corps. At noon in Wheeler Hall, Peace Corps Deputy Director Carrie Hessler-Radelet will present a plaque honoring UC Berkeley for its historic distinction among universities as the all-time top producer of Peace Corps volunteers. The program will include a short video documentary about UC Berkeley’s enduring connection to the Peace Corps and Skype messages from UC Berkeley alumni currently serving oversees. Earlier at Alumni House, Hessler-Radelet will join returned Peace Corps volunteers and graduate students in public health for a discussion “Launching a Career in Global Public Health with the Peace Corps.” And throughout the day, student organizations dedicated to public service will promote their programs in lower Sproul Plaza. As for other Cal Day presentations, among this year’s more topical panel discussions are “Egypt 2011: Is This a Revolution?” and “Can Americans be civil and work together to solve public problems?” Meanwhile, physics professor Richard Muller, author of “The Instant Physicist” and “Physics for Future Presidents,” will discuss the importance of understanding basic science. 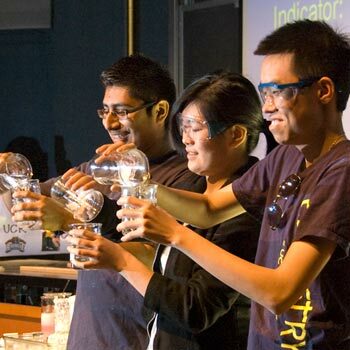 At another presentation, students from the American Nuclear Society will present their projects, including a backyard nuclear reactor and a mousetrap fission chain-reaction model. From the frontiers of brain science, UC Berkeley psychologist and neuroscientist Matthew Walker will discuss his research on how sleep improves learning, memory and emotional balance in his talk, “Secrets of the Sleeping Brain. “In another lecture, public health professor Dr. Ronald Dahl will offer clues to the inner workings of the teenage brain. 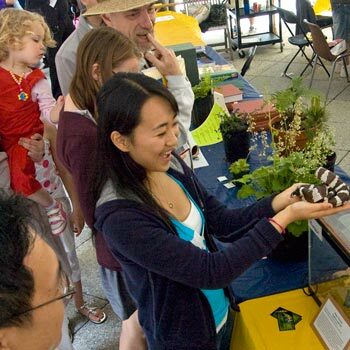 Since UC Berkeley’s centennial in 1968, the nation’s top public research university has hosted an open house showcasing the best of its teaching, research and public service. In 1995, “Cal Day” became an annual event that each year has continued to attract tens of thousands of visitors from the Bay Area and beyond, many of them prospective or newly-admitted UC Berkeley students. Cal Day 2011 offers numerous orientation presentations for new students and their families. At Haas Pavilion at 8:30 a.m., Chancellor Robert Birgeneau will welcome new students. At the noon Cal Spirit Rally, the Cal Marching Band, Oski and others will greet and serenade newcomers and alumni alike. Throughout the day, new students can check out academic, recreational and volunteer opportunities at the Marketplace on Dwinelle Plaza. Across campus, kids, science geeks and culture vultures will find plenty to do. The Valley Life Sciences Building will be abuzz with such activities as “Bugs Galore,” “Touch a Meteorite” and “Snake Guts: how to dissect an animal.” Graduate student Katherine Brakora will discuss how cattle, antelope, deer and giraffes are able to grow such cranial appendages as horns and antlers. The Phoebe A. Hearst Museum of Anthropology will have on display Egyptian artifacts, including statues and amulets. And at the Zellerbach Playhouse, a series of three performances will explore the world of technology through dance. Speaking of technology, computer science professor Pieter Abbeel will program robots to perform such tasks as folding laundry at the Robot Learning Lab at Sutardja Dai Hall. At Soda Hall, visitors can try their hand at computational game theory, courtesy of Gamescrafters, an undergraduate research group at UC Berkeley. Admission is free to Cal Day, and no registration is necessary. Parking is also free, but limited. Free shuttles will run all day between the downtown Berkeley BART and campus attractions. Campus tours via a motorized cable car will be offered throughout the day. A complete schedule of Cal Day events includes a search engine that lists events by category and by times. UC Berkeley Celebrates the 50th Anniversary of the Peace Corps: The event will include a plaque presentation to the campus from Peace Corps Deputy Director Carrie Hessler-Radalet; Skype messages from Peace Corps volunteers currently serving overseas; and a panel presentation of current and past volunteers. Noon-1 p.m. Wheeler Hall. New Student Welcome: An early-morning session with Chancellor Birgeneau and campus leaders, who will share their insights on the UC Berkeley experience. 8:30–9:15 a.m., Haas Pavilion. Q & A with Freshmen Cal Students: Cal Student Orientation counselors share their first-year experiences with new students. 11 a.m. noon, 155 Dwinelle Hall. Starting Off on the Right Foot at Cal: Tips for a successful transition to college, including time management and managing stress, homesickness and more. University Health Services staff psychologist James Lyda. 11 a.m.-noon, 10 Evans Hall. Egypt 2011: Is This a Revolution? A panel discussion led by Mary Elizabeth Berry, chair of history, will ask how this moment in Egypt, Tunisia, Yemen, and Jordan compares with what the textbooks present as pre-revolutionary or revolutionary change. 1–2:30 p.m., 145 Dwinelle Hall. Can Americans be Civil and Work Together to Solve Public Problems? A panel discussion led by Henry Brady, dean of the Goldman School of Public Policy, will debate polarization, civility, public participation and the opportunity for meaningful policy initiatives at the local, state, and federal level. 2-3:30 p.m., Toll Room, Alumni House. Secrets of the Sleeping Brain: UC Berkeley psychologist and neuroscientist Matthew Walker discusses new discoveries that suggest sleep helps improve learning and memory, and balances our emotions. 11 a.m.-noon, 2050 Valley Life Sciences Building. Adolescence, Brain Development and Public Health: Public Health professor, Dr. Ronald Dahl talks about how exciting new discoveries in neuroscience are revolutionizing our understanding of the inner workings of human thoughts, emotions, and behavior. 10-11 a.m., 160 Dwinelle Hall. Conquering the Dark Side of the Universe: Astronomy professor Hitoshi Murayama will tell stories of scientists who’ve been searching for answers and trying to conquer the dark side of the universe. 11-11:45 a.m., 4 LeConte Hall. Electric Drive Vehicles: Past and Future: Timothy Lipman, co-director of the Transportation Sustainability Center, will lead a discussion about the history of electric vehicles and where they’re headed. 11 a.m.-noon, 145 McCone Hall. Snake Guts! See How to Dissect an Animal: Witness a dissection demo that highlights the strange evolutionary features snakes have adapted for elongation. 11 a.m.-noon, 3101 Valley Life Science Building,Grinnell-Miller Library. DNA in Action: A Hands-on Demonstration: Evolutionary Genetics Lab Manager Lydia Smith demonstrates the basic steps of a DNA extraction in this “lab demo meets cooking show.” 2-3 p.m. 3101 Valley Life Sciences Building, Grinnell-Miller Library. How to Grow Cranial Appendages: Cattle, antelope, deer, giraffes, and their close relatives almost always have some kind of cranial appendage – horns, antlers, and the like. How similar are these structures? What do we know about how they grow? 10–11 a.m., 2040 Valley Life Sciences Building. Robot Folds Laundry; In the Robot Learning Lab, computer scientist Pieter Abbeel will present a demo of robots folding laundry. 10 a.m.-noon, 3rd floor, Sutardja Dai Hall. Controlling Robots with the Mind: Students, wearing electroencephalography (EEG) sensors on their heads, will use mind control to move robots. Noon–3 pm,Cory Hall, 140AB. Earthquake Shake Table: Members of Pacific Earthquake Engineering Research will use building materials and a shake table to show how buildings hold up in earthquakes. 10 a.m.-3:30 p.m., 2nd floor, Davis Hall. Launching a Career in Global Public Health with the Peace Corps: Peace Corps Deputy Director Carrie Hessler-Radelet joins public health students to discuss how to launch a career through the Peace Corps in global public health. 9:30-11 a.m., Toll Room, Alumni House. Swahili, Zulu, Chichewa and Wolof in One Easy Lesson! In 30-minute mini-sessions, learn to ask questions and carry on a basic conversation. 1–2:30 pmDwinelle Hall, B4. Cal Women’s Tennis vs. Stanford, noon-2 p.m., Hellman Tennis Complex. Cal Women’s Softball vs. Oregon, 1-4 p.m., Levine-Fricke Field.